Ownership / Access: Property of the French Community of Belgium. Notes: Château de Seneffe is an 18th-century château located in the municipality of Seneffe in the province of Hainaut, Belgium. The château is property of the French Community of Belgium and serves as the "Centre de l'orfèvrerie de la communauté française" which displays a collection of antique (mainly 18th century) silverware. In 1758 the 'Seigneurie de Seneffe' was bought by Joseph Depestre, a Walloon merchant who earned a fortune by selling goods to the Imperial Austrian troops stationed in the Austrian Netherlands. Depestre's new status as a wealthy and influential individual was also confirmed by the acquisition of noble titles such as 'Seigneur de Seneffe' (Lord of Seneffe) and 'Count of Turnhout'. The new castle designed by Laurent-Benoît Dewez had to match with Depestre's new noble status. It was erected between 1763 and 1768 in a novel neoclassical style. When Joseph Depestre died in 1774 the decoration of the château and the embellishment of the park were continued by his widow and his eldest son Joseph II Depestre. After the French revolution and the subsequent occupation of the Austrian Netherlands by the French Republic, the château was confiscated (1799). It was bought by a figurehead assigned by the Depestre family and came back into their possession after the ascent of Napoleon as Emperor of the French in 1804. The château was sold by Joseph II Depestre's son Honoré in 1837 and bought by the Daminet family. In 1888 it was acquired from them by Baron Goffinet. The last private proprietor was a Belgian banker of Jewish origin, Franz Philipson, who bought the 'domaine' in 1909. In the advent of the Second World War the Philippson family escaped to England and the United States. 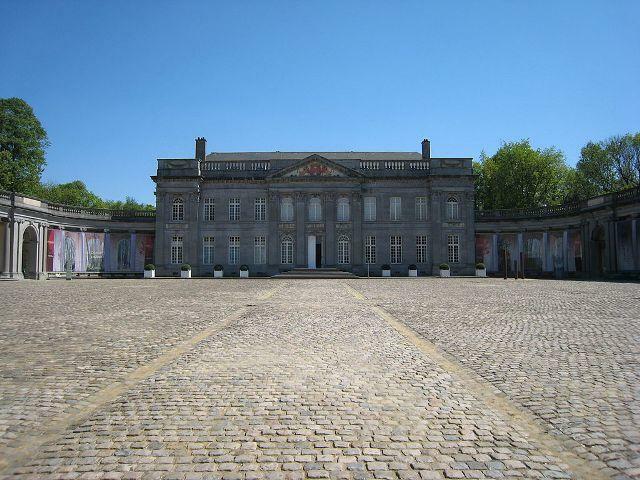 When German troops invaded Belgium in 1940 the château was confiscated by the Germans and used as a local headquarters and a summer residence for the German military Governor of Belgium, General Alexander von Falkenhausen. After the liberation of Belgium in 1944 it was occupied by the US Army. It was acquired from the Philippson heirs in 1952 by the "Collège du Sacré Coeur" which used it as a school between 1952 and 1963. The castle of Seneffe was then abandoned for 7 years, until the Belgian State decided to purchase it in 1970. During these years the castle was severely looted by people who removed and sold valuable interior decoration such as marble fireplaces and carved wainscotings. After the acquisition by the Belgian state the deterioration continued due to defected doors, windows and roofing. Extensive interior and exterior renovations were only started after 1978 and were not finished until 1995.